Your business success is now forever linked to the success of your customers Customer Success is the groundbreaking guide to the exciting new model of customer management. Business relationships are fundamentally changing. In the world B.C. (Before Cloud), companies could focus totally on sales and marketing because customers were often 'stuck' after purchasing. Therefore, all of the 'post-sale' experience was a cost center in most companies. In the world A.B. (After Benioff), with granular per-year, per-month or per-use pricing models, cloud deployments and many competitive options, customers now have the power. As such, B2B vendors must deliver success for their clients to achieve success for their own businesses. Customer success teams are being created in companies to quarterback the customer lifecycle and drive adoption, renewals, up-sell and advocacy. The Customer Success philosophy is invading the boardroom and impacting the way CEOs think about their business. Today, Customer Success is the hottest B2B movement since the advent of the subscription business model, and this book is the one-of-a-kind guide that shows you how to make it work in your company. Customers want products that help them achieve their own business outcomes. By enabling your customers to realize value in your products, you're protecting recurring revenue and creating a customer for life. 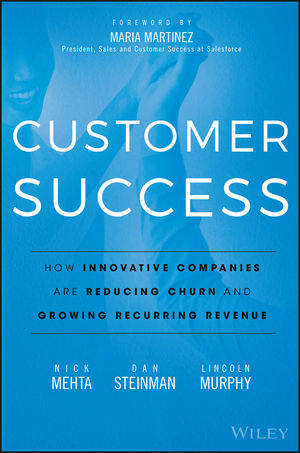 Customer Success shows you how to kick start your customer-centric revolution, and make it stick for the long term. NICK MEHTA is CEO of Gainsight, where he brings the right people together and puts them in the best position to win for customers, partners, employees, and their families. He's a big believer in the Golden Rule, and he uses it to bring more compassion to interactions with others. DAN STEINMAN is the chief customer officer for Gainsight. He is the author of dozens of relevant blogs, contributed articles, and Customer Success University created by Gainsight and a recognized thought leader in the Customer Success world. LINCOLN MURPHY is founder of Sixteen Ventures, a consultancy helping companies accelerate growth through Customer Success. He's a prolific writer and international speaker on Growth and Customer Success.